The Circle (Sammy Hagar, Michael Anthony, Jason Bonham, & Vic Johnson) w/ Toby Keith, Chad Kroeger, Darryl McDaniels, Eddie Money, Vinnie Paul, and more. Sammy is bringing his epic multi-night birthday bash at his Cabo Wabo Cantina in Cabo San Lucas, Mexico to movie theaters nationwide on December 5, 2017. Cameras will be on hand to capture all the action at the rock legend’s world-famous bar for this exclusive cinema event including performances by Toby Keith, Chad Kroeger (Nickelback), Darryl McDaniels (Run DMC), Eddie Money, Vinnie Paul (Pantera), The Circle’s Michael Anthony, Jason Bonham, Vic Johnson and more. Presented by Fathom Events and AXS, “Red Til I’m Dead: Sammy Hagar’s Rock-N-Roll Birthday Party” will feature the best of the performances and party action from the four-day rock spectacular when it hitscinemas nationwide for one night on Tuesday, December 5 at 7:30 p.m. local time. Moviegoers will also enjoy a behind-the-scenes look at the music that spans the career of the one and only Red Rocker, plus birthday wishes from famous friends. 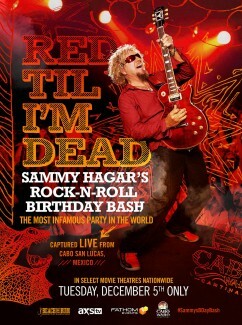 Happy 70th Birthday Sammy Hagar! Hey Sammy. Loved the movie. Felt like I was there. It's time for a Wabo's tour in 2018. I'm sure Mona, Dave, Vic and the fans want it. Keep the party going Sammy. Don't hibernate in 2018. Love you bro! The show was fantastic! Saw myself several times during the fourth show footage. PLEASE PUT THIS OUT ON DVD!! Went to Cabo, but didn't get in. My friend and his wife did, so my wife and I hung outside. At lease I got a t-shirt for it. Got to talk to Roger Clemens when he came out. Going to the show tonight at a theater that serves beer. Got tix soon as they went on sale! Cant wait til Dec 5th to see movie. Hey my Tampa Redheads see you at the movies!!!!! Great question, i have just the spot on my wall for it. I would love to be able to get a poster too! No pre-sale for members (or those of us who were there)? Will you all be selling the poster?